The 2014 Cadillac CTS looks great but as this midsized sedan heads upscale with a sharp new exterior and larger dimensions, many who expect a spirited ride from the CTS were concerned that this larger, more luxurious CTS sedan would remove the fun to drive factor from the current generation midsized sedan. This new video not only shows that the 2014 CTS handles well – but it does so on a wet road course when being pushed to the limits. 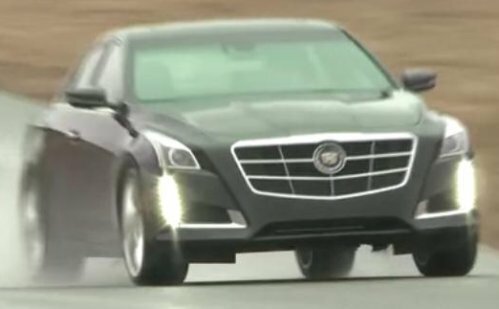 There really isn’t anything about the 2014 Cadillac CTS sedan that we didn’t learn from the 2013 New York International Auto Show debut but this video shows how well the new CTS will handle a road course under the control of a lead footed driver. Making this display of high performance handling even more impressive is the fact that this video was shot in the rain so not only is the road course intricate…but it is also very wet. However, that doesn’t prevent the CTS from being thrown through both tight corners and long, sweeping turns with the greatest of ease in addition to comfortably braking to handle those turns and accelerating hard out of them. In addition to showing us how well the 2014 Cadillac CTS, we get a great example of what the new CTS sounds like at wide open throttle. Unfortunately, it is not entirely clear which engine is under the hood of the CTS being flogged on the wet road course in the video below and while some sources have speculated that it is the new 3.6L twin turbocharged V6, the still shots at the end of the video show the standard 3.6L V6 . This is evident by the fact that the engine cover does not boast of being a twin turbo mill while those shots of the new TT V6 have clearly been labeled as such. That being said, it is impressive how throaty the standard V6 is when being pushed hard – provided that we are indeed seeing a naturally aspirated V6-powered CTS sedan in action. Even with the base V6, the new CTS appears to accelerate very well in the midrange and we can expect that the turbocharged 4-cylinder and the twin turbo V6 will be that much better. This first moving video of the 2014 Cadillac CTS sedan provides a great look at the new midsized luxury contender from every angle with a look at the headlights and taillights all lit up. Oddly, it looks in some shots like the passenger’s side LED fog light assembly is not working when the projection headlights are on while in other shots, both lower lights are brightly lit when the headlights are off. Those who are in the greater New York City area, the 2014 Cadillac CTS sedan will remain on display in Jacob Javits Convention Center through this weekend so if you want to get a first hand look at this great looking midsized luxury sedan outside of the annoying dealership environment - you have until this Sunday to do so at the Big Apple show. Click any of the thumbnails on this page for a closer look at the new 2014 Cadillac CTS sedan from the 2013 NYIAS debut and check out the video below of the new CTS sedan in action on an undisclosed wet road course.